As part of my monitoring process, I took upon myself to update the list of Dividend Champions every month. I have found it very helpful to update the list, in an effort to monitor more closely the list of dividend champions. This is the third update of the dividend champions list I have done so far. You can review the last one containing the August 2018 Dividend Champions list here. The process of checking for dividend increases is fairly manual. It is somewhat easy to update the list, since I review the list of dividend increases every week for my blog readers, and provide some detail on companies that raised distributions as part of my research. The other step I use it to review forward dividends in a Yahoo Finance customized stock list relative to the dividend payments that I have included from the prior month. This helps me identify any companies that may have slipped through the crack. The next step involves reviewing differences, in order to determine whether I have inaccurate data or whether I have actual dividend increases. Unfortunately, this process can only be automated so much. It still requires verification against a company press release, in order to confirm that a dividend increase occurred. Still, it is a helpful exercise to go through updating the list of Dividend Champions, because the work helps me to focus and familiarize myself with more companies for further research. When I have an understanding of a company's business model, I am better prepared to act when the right opportunity presents itself. I have a tremendous amount of respect for the work which David Fish quietly did for a decade, since he also updated the list of Contenders and Challengers, which is several times larger than the list of dividend champions. For the purposes of my research however, I have found that focusing on the dividend champions is enough for now. You can download the list from this location. There were two new dividend champions that joined the list in August. Arrow Financial Corp. (AROW) raised its quarterly dividend by 4% to 26 cents/share. This was the 25th consecutive increase for this dividend champion. BancFirst Corp. OK (BANF) raised its quarterly dividend by 42.86% to 30 cent/share. Bancfirst has increased dividends for 25 years in a row. There was one removal, which I overlooked in August. WGL Holdings (WGL) last day of trading was on July 6. The company was acquired. There were a few notable dividend increases over the past month from the list of dividend champions. Those include the following companies, their ticker, the rate of most recent increase and consecutive streak of annual dividend increases. Altria Group Inc. (MO) raised its dividend by 14.269% to 80 cents/share. 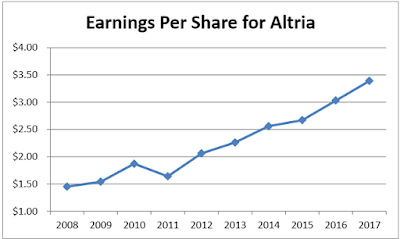 This was the second dividend increase this year for Altria. Altria has raised dividends for 49 years in a row. American States Water (AWR) raised its quarterly dividend by 7.84% to 27.50 cents/share. American States Water has the longest track record of annual dividend increases with 64 annual dividend hikes in a row. AptarGroup Inc. (ATR) hiked dividends for a second time this year. The company raised distributions by 6.25% to 34 cents/share. AptarGroup has a 25 year track record of annual dividend raises for shareholders. Badger Meter Inc. (BMI) increased its quarterly dividend by 15.38% to 15 cents/share. This marked the 26th consecutive annual dividend increase for this dividend champion. Carlisle Companies (CSL) raised its quarterly dividends by 8.11% to 40 cents/share, marking the 42nd consecutive annual dividend increase for the company. Community Bank System (CBU) raised its quarterly dividend by 11.76% to 38 cents/share. This marked the 26th year of annual dividend increases for the company. Community Trust Banc. (CTBI) raised its quarterly dividend by 9.09% to 38 cents/share, marking the 36th annual dividend increase for the company. Dover Corp. (DOV) raised its quarterly dividend by 2.13% to 48 cents/share. This marked the 63rd consecutive annual dividend increase for this dividend king. Eagle Financial Services (EFSI) raised its dividend by 4.35% to 24 cents/share. This was the second dividend increase this year for Eagle Financial Services. The company has raised dividends for 32 years in a row. Federal Realty Inv. Trust (FRT) is a dividend king, which recently raised its quarterly dividend by 2% to $1.02/share. Illinois Tool Works (ITW) raised its quarterly dividend by a staggering 28.21% to $1/share. The company has rewarded shareholders with a raise for 44 years in a row. MGE Energy Inc. (MGEE) boosted shareholder payouts by 4.65% to 33.75 cents/share. This marked the 43rd consecutive annual dividend increase for the company. Nordson Corp. (NDSN) raised its quarterly dividends by 16.67% to 35 cents/share. This marked the 54th consecutive annual dividend increase for this dividend king. You can obtain the list of September Dividend Champions from here. Altria Group, Inc. (MO), through its subsidiaries, manufactures and sells cigarettes, smokeless products, and wine in the United States. The company is a dividend champion, which has rewarded shareholders with a dividend increase for 48 years in a row. Altria raised its quarterly dividend by 14.30% to 80 cents/share. This was the second dividend increase this year, after the 6.70% raise in March. 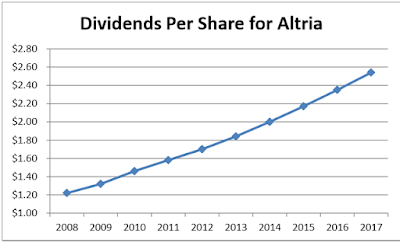 This dividend increase reflects Altria’s intention to return a large amount of cash to shareholders in the form of dividends and is consistent with Altria’s dividend payout ratio target of approximately 80% of its adjusted diluted earnings per share. Altria has increased its dividend 53 times in the past 49 years. Despite all the issues that tobacco companies have faced over the past decade, the increased regulation has created an environment which has helped deliver solid results for shareholders. While the number of smokers decreases each year, the increases in cigarette prices more than compensate for that. In addition, it is almost impossible for a new cigarette manufacturer to create a brand to compete with established players like Altria Group (MO). Despite all the gloom, the company has been the best performer in the S&P 500 over the past 50 years. It is impressive to see how the company, which distributed almost all of its profits back in the form of dividends, is able to grow earnings per share over time. 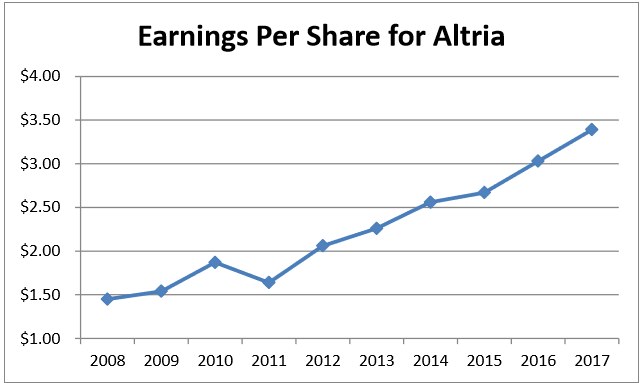 Between 2008 and 2017, Altria managed to boost its earnings per share from $1.45 to $3.39. The company is expected to earn $4.01/share in 2018. 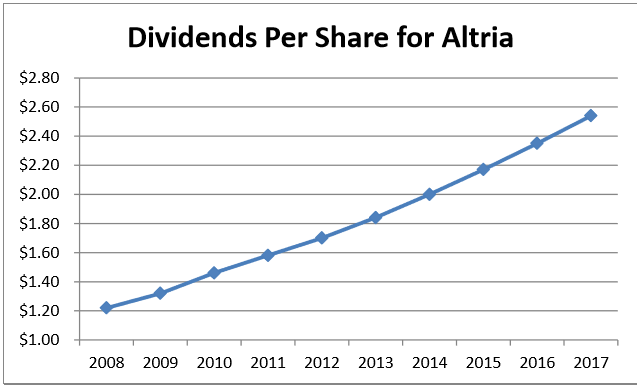 This means that Altria has a forward dividend payout ratio of roughly 80%. During the same time, the annual dividend went from $1.22/share in 2008 to $2.54/share in 2017. The forward annual dividend payment stands at $3.20/share. I find Altria to be attractively valued today at 14.70 times forward earnings and a dividend yield of 5.40%. Subscribers to the Dividend Growth Investor newsletter received ten ideas for research on Sunday. The newsletter included information behind each company, and relevant research behind each company listed. I discussed how much I am allocating to each investment when I initiate my buy orders at the open on Monday. In addition to that, subscribers will obtain an updated list of dividend portfolio holdings. Premium readers get a first glimpse of the process I use to allocate fresh capital into ten ideas each month. I will continue adding $1,000/month to this portfolio, and provide educational input on the complete process of dividend portfolio management. The process includes researching investments, adding companies to the portfolio, and then monitoring the portfolio regularly while tracking the progress towards its long-term goals. By using broker Robinhood, I am spending zero on commissions. The price for the monthly subscription is just $6/month to new subscribers who sign up for the service. The price for the annual subscription is only $65/year for new subscribers. If you subscribe at the low introductory rate today, the price will never increase for you. Once you sign up, I will add you to my premium mailing list, and you will receive all exclusive content related to the portfolio. The ultimate goal of this portfolio is to generate $1,000 in monthly dividend income. I will track my progress towards our goal every month. I plan to track this portfolio in real time over the next few years, and track our progress towards our goal. I view this exercise mostly as an educational tool, that will hopefully show how I build and manage a dividend portfolio. Thank you for reading Dividend Growth Investor. What are my dividend portfolio holdings? As someone who has been publicly investing in dividend growth stocks for over a decade, I have amassed a nice dividend growth portfolio. I have accumulated a diversified position one investment at a time. My dividend income covers my expenses after saving aggressively, reinvesting dividends selectively, and letting the power of compounding do the heavy lifting for me. As a result, a frequent question I receive is to ask me about my dividend portfolio holdings. I believe that this question is misguided. This is because there are a lot of companies I own today, which I would not buy right now for a variety of reasons. For example, when I bought shares of Visa (V) in 2011 and 2015, they were selling for 20 times forward earnings. However, those shares sell above 20 times forward earnings today, which prevents me from buying them right now. While I hold Visa, I would not buy it today. If those shares are available at 20 times forward earnings, and fundamentals are still intact however, I will be interested in adding to my position in Visa. As an individual investor, you should not really care if I own Visa or not, because the circumstances which caused me to buy in the first place may no longer be present. 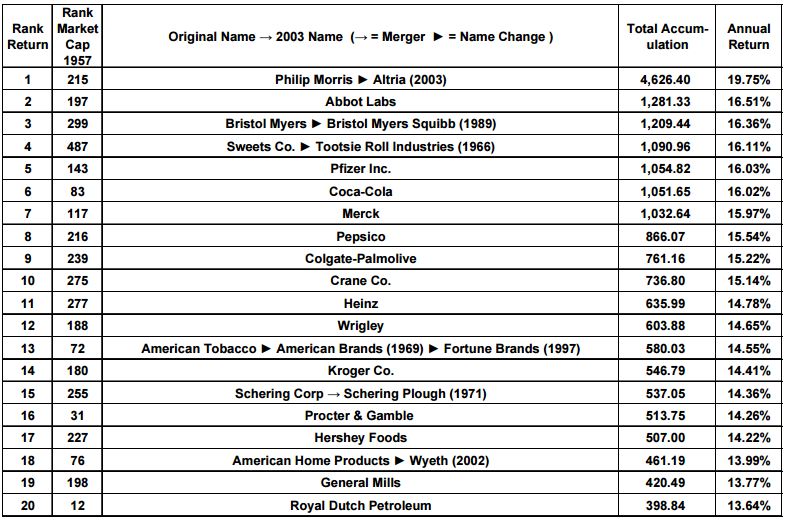 In another example, I have bought shares of Procter & Gamble (PG) on several occasions between 2008 and 2013. I believed that the company is strong, and always expected its earnings per share to grow. After several years of stagnant earnings per share however, I stopped adding to the stock. Rising earnings per share provide the fuel behind future dividend increases. 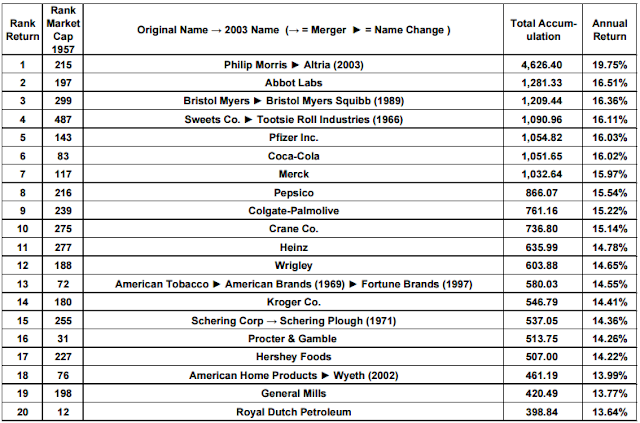 Since earnings per share have not increased for a decade now, I would not consider buying Procter & Gamble. Now I will hold on to my shares for years, until they probably cut dividends ( which is not very likely). However I would not be interested in buying the stock today. As you can see from these examples, asking someone what they own may be misguided. A much better question could be: What do you find interesting today? If you are looking for a list of quality dividend paying companies available at attractive valuations, you are in the right place. My dividend growth stock newsletter invests $1,000/month in 10 quality dividend paying companies that I find to be good values. Subscribers receive a report that includes an analysis for each one of those ten dividend stocks. The report comes out every last Sunday of the month, while the investments are made with real money on the very next day. Subscribers also receive portfolio updates, and are able to observe how I build a portfolio from scratch. In addition, you will also receive real-time alerts when we make investments in the dividend growth portfolio. As a long-term investor, I try to purchase companies to hold for the long run. This is why I am very careful in evaluating fundamentals, valuation and dividend safety in my equity selection process. The next newsletter will be sent out to subscribers on August 26. For a low price of just 6/month, you will receive our premium newsletter by email once per month. The annual subscription is an even better value at $65/year, where you essentially end up getting one month for free. There is a 7 day free trial, during which your card will not be charged. After that, you can still cancel at any time, but you will be charged. The newsletter comes out the last Sunday of every month, with actionable ideas that I will invest my money in. If you subscribe today, you will lock in the low prices forever. If you subscribe today your price will never increase. I guarantee it. I usually try to analyze one dividend paying company every week. In a typical stock analysis report, I would outline the years of consecutive dividend increases along with the amount and timing of the latest dividend increase. This should be a helpful review for readers of the premium dividend growth investor newsletter and all readers in general. I would then look at trends in stock prices, earnings per share, dividends, and dividend payout ratios over the preceding decade. Right under earnings per share, I typically try to discuss qualitative factors that might drive future profitability. I believe that rising earnings per share is the fuel behind future dividend increases. The rising stream of earnings per share also allows for growth in intrinsic values over time. I am not a big fan of stagnant earnings per share, because this shows me that there is natural ceiling for future dividends to grow. Therefore, I am losing purchasing power for my dividend income and intrinsic value over time. While some higher yielding companies tend to have low growth in earnings per share, but compensate with the high dividend, I still want some growth in the future. We also want to review the quality of earnings over time. The trends in earnings per share should show you how cyclical those profits are over time. For cyclical companies, earnings per share are their highest at the top of the economic cycle. Therefore, P/E ratios are relatively low and these companies appear cheaper than they really are. We want stable and dependable earnings as much as possible. A historical review, coupled with a qualitative understanding of the dependability of the business model throughout the economic cycle, is important. I tend to review trends in dividend payout ratios, in order to determine dividend safety. As an investor whose goal is to live off dividends in retirement, dividend safety is of paramount importance. Once you hit the dividend crossover point, which is the point where dividend income exceeds your expenses, you are good to go as long as the dividend is stable and growing over time. The goal of the dividend investor is to stay retired no matter what happens in this unpredictable world. This is why I not only want a dividend payout ratio that is generally below 60%, but also want a growing dividend that is supported by growth in underlying fundamentals ( earnings per share). In other words, I would like to see a dividend payout ratio that stays within a range, rather than a situation where companies grow dividends by paying out a larger and larger portion of the earnings pool. For most companies, there is a need to reinvest a portion of earnings in the business to grow. Anything in excess of that should be distributed back to shareholders, or else risk being wasted by executives on ill-timed acquisitions, corporate jets or projects with poor visibility and sub-par expected risk adjusted returns. Of course, I also review the trend in dividends per share. Dividends are more stable and dependable than stock prices, which is what makes them an ideal source of income for retirees. I want to focus on companies which can pay and grow dividends no matter where they are in the economic cycle. 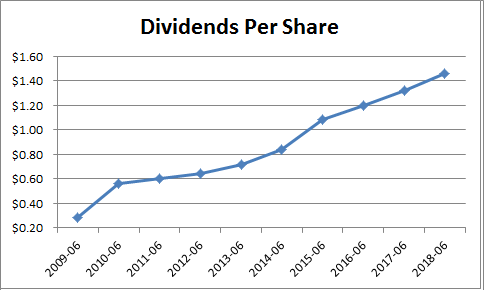 I review the recent increases in dividends versus the trends over the past decade. A rising dividend indicates a management team that is shareholder focused, which also wants to establish a track record of sharing excess shareholder wealth with the rightful owners of the business. The rising dividend that is based on growing earnings, and coupled with a sustainable payout ratio, while available at an attractive valuation is something I look for in an investment. Basically in the article I discuss how I like a record of dividend growth, earnings growth and a sustainable dividend payout ratio. If the stock has these traits, I then focus on valuation. In my conclusion section, I usually link to my article on entry criteria when I call a stock attractively, fully or overvalued. In my article on entry criteria I discuss that I am not willing to pay more than 20 times earnings for a stock. If the company trades at less than 20 times earnings, I would call it attractively valued and call it a day. However, if the stock trades above 20 times earnings I would try to calculate a reasonable price which would make it a good buy on dips. This entry criteria applies to most corporations that pay dividends and are traded on exchanges. For example, Automated Data Processing (ADP) trades at 27.50 times forward earnings, which is above the price I am willing to pay for it. If it earns $5.18/share, at 20 times earnings, the most I would pay is $104/share. Hence, if I posted an analysis on ADP I would say it is overvalued at 27.50 times earnings, and would buy on dips below $104/share. If Automated Data Processing (ADP) traded at $90/share, and earned $5/share, I would say it is attractively valued at the moment. For example, in my analysis of Johnson & Johnson (JNJ), I discussed that I thought the stock was attractively valued at the moment. I link to my entry criteria article, because I want readers to understand how I value company stock. For a recent dividend stock analysis of Starbucks (SBUX), I assigned an entry price of $48/share at $2.40/share in earnings per share. If you read the article in 12 months and the stock trades at $70 but earns $4/share, you would think it is above fair value and ignore it completely for that reason. However, at $70, the stock would have been attractively valued since the P/E is a reasonable 17.50. Readers would notice that I do not assign “fair values” to stocks I analyze. I am not going to complicate my screens by using discount rates, forecasting future dividend payments and discounting them back etc. Instead I use the P/E and yield as mentioned above. However, I do select companies that have raised dividends for at least a decade, and which usually have done so above the rate of inflation. In the end, yield and dividend growth is a balancing act. This should go without saying, but in the valuation criteria I look at P/E ratios in conjunction with looking at earnings growth rates and dividend growth rates. If we select a company with a higher P/E ratio, we would expect a higher growth in earnings and dividend growth. For an equity with lower P/E ratios, we would generally see slower growth but probably a slightly higher yield. I select companies that have not only raised dividends for long periods of time, but I believe also have a decent shot of continuing that in the foreseeable future. I expect dividends to grow over time, I just don’t want to overcomplicate things by assigning forecasted values and proving my point mathematically. I would avoid doing math since I can mention my expectations with one single sentence or less, and have them already built into the assumption. Starbucks Corporation (SBUX), together with its subsidiaries, operates as a roaster, marketer, and retailer of specialty coffee worldwide. The company operates in four segments: Americas; China/Asia Pacific; Europe, Middle East, and Africa; and Channel Development. Starbucks is a dividend challenger, which has increased dividends every single year since it initiated its first dividend in 2010. The last increase occurred in June 2018, when Starbucks hiked its quarterly dividend by 20% to 36 cents/share. The stock has compounded by 21.90%/year over the past decade. This came off the lows in 2008, when the stock was depressed due to mismanagement and the global financial crisis. Future returns would be much more reasonable in my opinion. Over the past decade, the company managed to boost earnings from $0.44/share in 2007 to $1.97/share in 2017. Earnings per share growth seems to have slowed down since 2015. That being said, Starbucks is expected to earn $2.41/share in 2018. Broadridge Financial Solutions, Inc. (BR) provides investor communications and technology-driven solutions for the financial services industry worldwide. The company raised its quarterly dividend last week by a massive 32.90% to 48.50 cents/share. With this increase, the company's annual divided has increased for the eleventh consecutive year since becoming a public company in 2007. The new quarterly payment is almost seven times larger than the dividend payment from a decade ago. This was possible due to the rapid expansion in the dividend payout ratio, as earnings managed to double. For history buffs, Broadridge Financial was spun-off from Automatic Data Processing in 2007. ADP itself has a long history of growth and dividend increases, which it has passed onto its spin off-spring. This dividend achiever is careful in its capital allocation strategy, as it focuses on projects with high return on investment, which could improve its competitive position and ability to serve its customers efficiently and cost effectively. This mindset has allowed the company to grow earnings and excess free cash flows, the majority of which are distributed in the form of dividends and share buybacks. Last month, I created my own dividend investing newsletter. It features ten quality companies for the long-term each month. This newsletter features companies that I am investing in every single month. This dividend portfolio would be a great teaching exercise on building a portfolio from scratch. We would also discuss diversification, how to allocate new cash towards new or existing position and how to monitor and manage the portfolio. Subscribers of the newsletter received a report listing the ten dividend paying companies I bought last week. I ran my screen against the list of dividend champions from June 2018, in order to identify bargains. The list of dividend champions includes companies that have managed to increase dividends to shareholders for at least 25 years in a row. The dividend champions list is more comprehensive than the list of dividend aristocrats, which is why I prefer to use it for my investing process. In this article, I discussed my approach to screening large groups of dividend growth stocks. Not surprisingly, I focus on qualitative and quantitative criteria to come up with a list of companies for further research. I updated the list of dividend champions on June 30, 2018. I discussed the process I took to do the updates, which is mostly manual in nature. I discussed this in an effort to educate investors how to maintain their own lists if noone updates it for the community on a go forward basis. After going through the process of just updating the list of dividend champions, I have a lot of respect for the amount of work that David Fish did on a monthly basis for a decade, in updating the champions, contenders and challengers lists. He will be missed. In this article, I highlighted three dividend growth stocks with a ten year record of annual dividend increases. Those companies had raised dividends in the preceding week. I review the dividend increases that interest me, as part of my monitoring process. I own two of the three companies mentioned in the article, and recently added to my position in one of them. In this article, I shared a simple model for forecasting dividend income using a few simple inputs such as dividend yield, dividend growth and the impact of regular contributions to a dividend portfolio. While the future is seldom linear, this model gives at least a ballpark estimate of what can be expected if certain assumptions are made. When playing with models, I have found it very helpful to change assumptions, and see what the overall impact to the end result turns out to be. It is always helpful to stress test assumptions. As part of my monitoring process, I review recent dividend increases. The process of identifying dividend increases is manual, because it relies on information coming from a list of multiple sources. I usually focus my attention on companies which have managed to increase dividends to shareholders for at least ten consecutive years. This is then followed by a brief review of trends in fundamentals and valuation. I like to compare the recent increase against the ten year average, and then try to discern whether that growth is supported by the business. Illinois Tool Works Inc. (ITW) manufactures and sells industrial products and equipment worldwide. It operates through seven segments: Automotive OEM; Food Equipment; Test & Measurement and Electronics; Welding; Polymers & Fluids; Construction Products; and Specialty Products. The Board of Directors of Illinois Tool Works Inc. (ITW) increased the company’s quarterly dividend by 28.20 percent to $1.00 per share. This marked the 44th consecutive annual dividend increase for this dividend champion. I took upon myself to update the list of dividend champions, after the untimely passing of David Fish two months ago. While there are other users updating the list, I find it helpful to be self-reliant, because I do not know how long they will keep updating it for. I use the list of dividend champions very often, which is why it is helpful to own the updates on my end, and then have a reliable source for my screening and monitoring process. I am not monitoring the list of dividend contenders and challengers at this time. I use the streak of consecutive annual dividend increases, along with the historical rates of annual dividend growth. I sometimes even review the annual dividend payments going as far back as 1999, in order to verify whether the streak of annual dividend increases listed is accurate. I discussed briefly the process I use to update the list of dividend champions in the last months update. By using a combination of data pulls from Yahoo Finance, references to my weekly reviews, and notification for companies that “should be raising their dividend” this time of the year, I was able to make some updates. This is a labor intensive process, and I find it hard to automate it. I titled the last file June 2018 Dividend Champions, because it was as of June 29, 2018. Some readers believed that it was for June and not July. So to avoid any confusion, I will call this list August 2018 Dividend Champions list. The list shows updated information on the number of dividend champions as of July 31, 2018. Therefore, it shows the list of dividend champions for August 2018. You can open the excel file from this location. We have one new dividend champion added for this month. Aptar Group (ATR) – after a 6.70% increase in the quarterly dividend to 32 cents/share. 25 years in a row. We have no dividend champions removed however. Tenant (TNC) company is in jeopardy of being removed from the list of dividend champions, since it hasn’t raised distributions since 2016. There were a few notable dividend increases over the past month from the list of dividend champions. Those include the following companies, their ticker, the rate of most recent increase and consecutive streak of annual dividend increases. Aqua America (WTR) – a 7% increase in its quarterly dividend to 21.90 cents/share. Aqua America has increased dividends for 26 years in a row. Computer Services Inc. (CSVI) – a 16.10% increase in its quarterly dividend to 36 cents/share. Computer Services has raised dividends for 47 years in a row. Medtronic (MDT) – a 8.70% increase in its quarterly dividend to 50 cents/share. It was announced in June. Medtronic has rewarded shareholders with annual raises for 41 years in a row. Realty Income (O) – increase monthly dividend to 22 cents/share. Realty Income has increased dividends for 25 years in a row. 1st Source Corp. (SRCE) – a 4.20% increase in the quarterly dividend to 25 cents/share, which is the second this year. 31 years in a row. Stanley Black & Decker (SWK) – a 4.80% raise in its quarterly dividend to 66 cents/share. The company is also a dividend king after raising dividends for 51 years in a row. National Retail Properties (NNN) – a 5.30% increase in its quarterly dividend to 50 cents/share. National Retail Properties has a 29 year streak of consecutive annual dividend increases.